I’ve always been a bit ambivalent about Bloody Marys but I think I’ve found the answer to change everything. 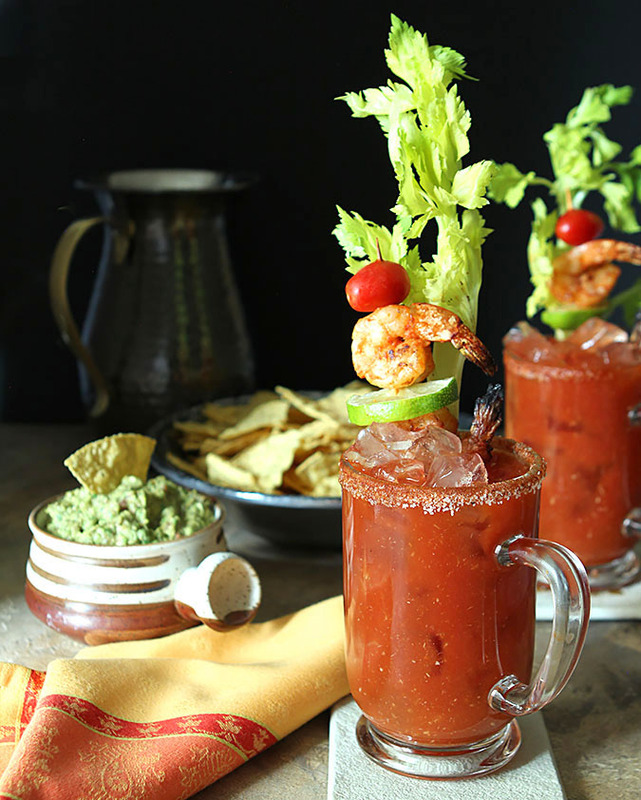 How about the Bloody Maria Cocktail – A Tequila Bloody Mary? 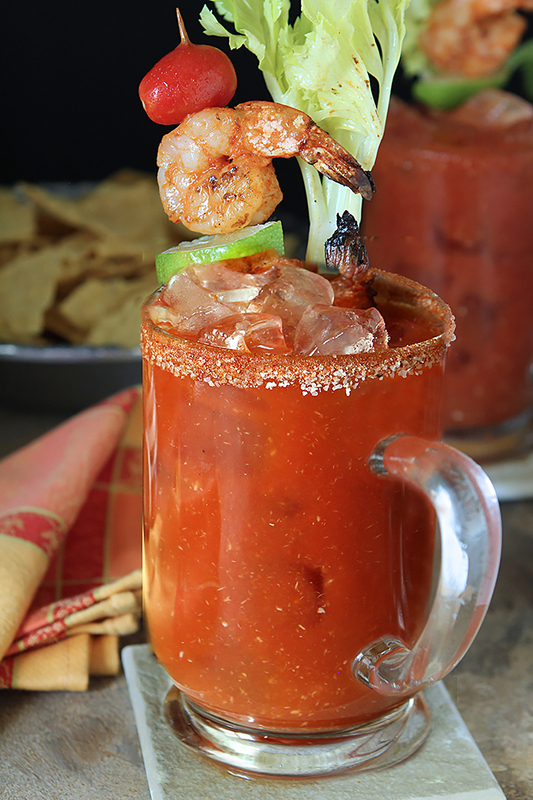 I much prefer this version combining tomato, tequila and grilled shrimp! I was challenged to make a Bloody Mary because, well, it’s not something I’ve ever included in my cocktail lineup before. I’m not sure why but if I’m honest? Maybe not my favorite cocktail. And no big reason why. I like the components fine but if given the opportunity, I’m making something else typically. So I put my thinking cap on and I think I’ve found a cocktail I can love; the Bloody Maria Cocktail – A Tequila Bloody Mary! Considering the lineup of tequila based cocktails I’ve included in my library, that should come as no surprise. Beyond the plethora of margaritas that include cherries, raspberries, strawberries, limoncello and more; there is the The Paloma and the Lone Ranger, a tequila cocktail with sparkling rosé wine and lemon. Lots and lots of tequila! I’ve also noticed that Bloody Mary’s are showing up everywhere looking more like nothing but a place holder for a meal. Quite honestly I’ve seen photos that are so over the top the drink was completely lost. I wanted a garnish but wanted it in keeping with the flavor profile of this cocktail and definitely wanted to keep it toned down. I love the look of celery garnishing a Bloody Mary so this Bloody Maria got that too; along with lime and tomato but the best part of this cocktail? The shrimp that I grilled after covering it in a combination of olive oil and Sriracha. Bacon? OK, maybe for the original but for this version…no. The shrimp was so perfect that even without a cocktail I will be making it again. The Sriracha also went into the cocktail in place of hot sauce. If you missed my post recently for a Hamburger Baked Bean Casserole where I shared about a local Colorado product, Rocky Mountain Sriracha, then you won’t know the newfound love I have for this product. Rooster be gone…this is my new favorite! This didn’t require a huge leap of faith and it brought a richer element we loved. I did make a salt combination for the rim but consider it optional and also mix it up for your tastes. I kept my mix pretty tame but if you’re the type that like’s it hot…add some cayenne pepper too. I thought guacamole and chips was required to serve with the cocktails and the avocado benefited from some of the same salt mixture I made for the rim along with more of the Sriracha…it was simple and outstanding. 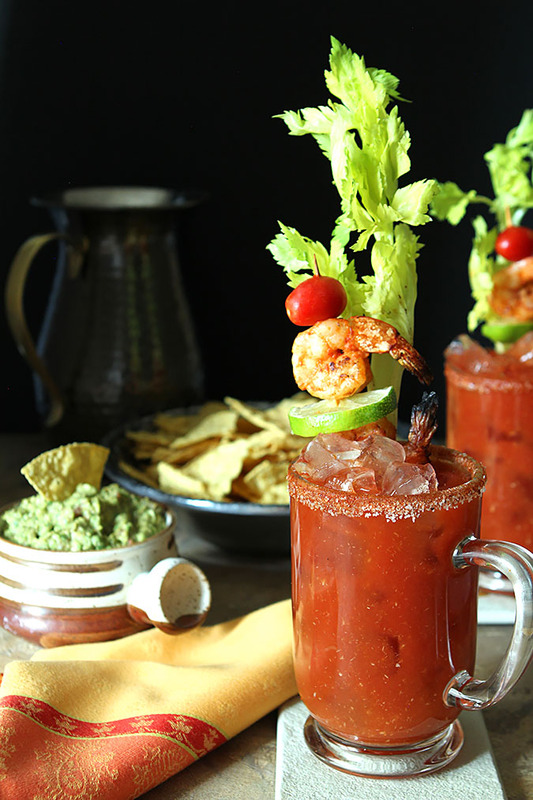 All in all just a nicer, spicier version of a classic cocktail; try this Bloody Maria Cocktail – A Tequila Bloody Mary, betting you like it too! Combine the Kosher salt, celery salt, paprika and garlic powder. Rub edge of glasses with lime wedge and dip them in the spice mixture. Combine the olive oil and sriracha sauce; add the shrimp and coat well. Grill on high heat for approximately 2-3 minutes per side until cooked through (I had medium shrimp and it took about 5 minutes). In a pitcher filled with ice, combine all the cocktail ingredients and stir until well chilled. Pour through a strainer into tall, ice-filled glasses. Garnish with celery stalk, grilled shrimp, lime wedge and cherry tomato.